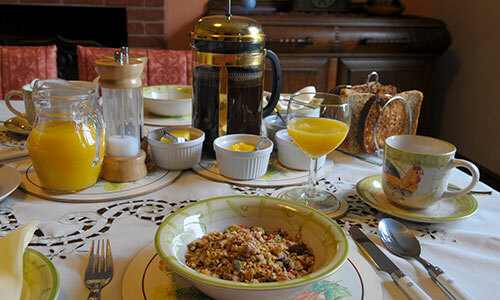 Here at Broome Park Farm B and B food plays an important part in our lives – as farmers we produce it and as hosts we are committed to providing high quality produce for all our guests. Your holiday experience starts the moment you arrive with a pot of tea or coffee and a plate of home baked goodies. There are also tea trays in both guest rooms with a selection of tea, coffee, fruit teas and hot drinks, also bottled water and home made cookies. Fresh milk is always available from the guest fridge. Where possible all food is bought and produced locally. Sausages and bacon are made from our own pigs by Griffiths of Leintwardine and eggs are laid daily by the girls in the Hen House – free range of course! Fresh milk is delivered to the door from Mawley Town Farm, the local dairy only 1 mile from here. They hold an annual open day in June where visitors can watch the complete process from cow to carton – the robotic milking parlour is amazing! We are also lucky enough to be served by 2 local bakers so there is always fresh bread – speciality breads, such as the dark, malty Shropshire Brown, can be supplied on request. I make jams from the fruits of the garden – raspberry, damson and plum and a lovely lady in the village makes the marmalade, selling it to raise funds for the MacMillan Nurses. Honey is gathered by mostly Michael’s bees – the hives dotted around the farm to aid crop pollination, although I have produced some of my own too. We now have our own apple juice too, pressed from the apples grown on the farm.. I can provide packed lunches or evening meals using local produce if they are booked in advance. Special diets can also be catered for – please advise when booking. If you wish to eat locally The Crown at Hopton offers tasty food only a 5 minute drive away, although not on Sunday, Monday or Tuesday evenings. Cleobury Mortimer has two excellent Indian Restaurants and most of the local pubs serve the award winning local ale – Hobsons – brewed in the town. The Kings Arms, on the High Street, serves traditional pub food at lunchtimes and evenings Monday to Friday and The Stable Tavern serves delicious home cooked food, not on Mondays. A new addition is a tapas menu at The Royal Fountain. For guests happy to travel a little further we can recommend local village pubs serving excellent food at reasonable prices. My personal favourites at the moment are The Hop Pole in Bewdley and The Peacock at Boraston. There is also Ludlow, only 10 miles away, with its reputation as a Foodie Paradise.